Being a member/subscriber of Employes Provident Fund Organisation is the best way for an employee to secure his/her future for a better life. There are many facilities for an employee like the member can withdraw their PF amount whenever they want too for their particular reason. The Employee Pension Scheme will help the member to secure their future by giving monthly pensions, The employee will have their own powers while doing service in any organisation which is connected with EPFO. The bigger facilities come with the bigger queries and problems as well. So, after the EPFO noticed there are a large number of employees who are facing many issues while doing withdrawals or while trying to update EPF UAN details online or their Employer does not play his/her role in contribution & did not help their employees for EPF either and much more. ★ If a member is facing issues in the organisation where he is working, he can raise the complaint against the Organisation or the Employer. ★ The EPFO will cancel the raised complaint if the employee did not provide his/her UAN number. So, the member should have an activated EPF UAN number in order to file a complaint (effective from 1st January 2016). ★ one can raise the complaint whether he/she is an employee, pensioner or employer. ★ Another facility is that the employee of the member who raised the complaint can also send the reminders if the issue did not solve within expected or given time. ★ The member can also view the status of the complaint that he/she raised. ★ The given time limit is 30 days from EPFO to resolve such complaints/grievance. Have You Already Suybmitted Your Complaint? Don’t worry. 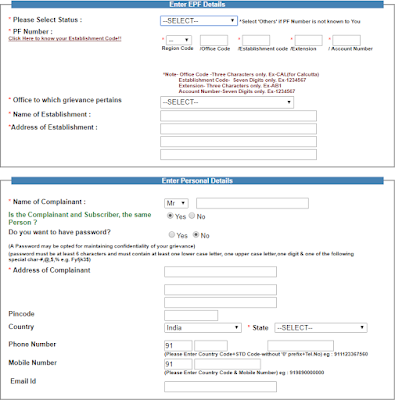 We’ve created a different page for you where you can easily access the steps to Track your complaint that you’ve submitted in EPF Grievance Portal. How Can I Access That Page? 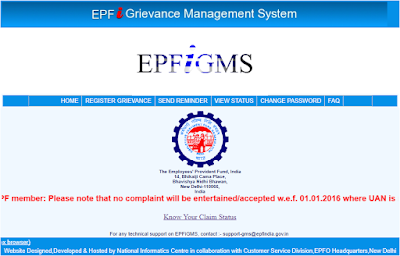 The first step is to go to the official portal @EPFiGMS where the member can lodge the complaint. 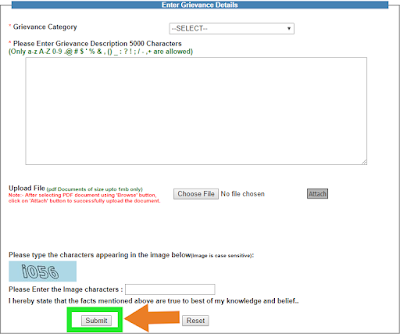 There are varieties of different menus that you can select as per your need (HOME – REGISTER GRIEVANCE – SEND REMINDER – VIEW STATUS – CHANGE PASSWORD – FAQ). Like, in this case, we’re covering the steps to register the complaints. So, the members have to select the menu named “Register Grievance”. When you click on Register Grievance, it will pop a new window which itself contains a form that you have to fill in (as shown in the image below). The fields with * are mandatory to fill. When you successfully filled in all the mandatory and other required fields you will be jumped to a new form in which you have to select the grievance type from the Grievance Catagory menu & have to explain the same with in-depth details in the given space. After you explained the issue, hit “SUBMIT”. 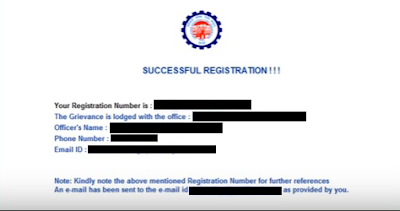 Finally, A confirmation message with your complaint details will be shown on your screen with a Registration Number that you must save for future reference. Please Note: You are on a dedicated page where we have given the ways and important points that will guide you step by step. Just scroll up, read the steps and follow the same in order to file a complaint. Please Note – You are on a dedicated page where we have given all the steps that you can follow to complain in the Grievance Cell. I am Rahul Kumar & i am not able to update my PAN Number in UAN, please help me regarding this. Can you please tell us that what type of issues you are facing when you try to link PAN Number With UAN? So we can guide you properly. Kindly update me how more time pf claim.because my pf form submission your Chennai office date 18/01/2018. And all pf sites not updated what is status. My pf no tnmas00514450000023983. i filled a grievance on the portal and nothing happened after clicking on the submit button and when i tried again, an error message popped up on the screen that the complaint is already registered and new complaint can be lodged after 30 days. i didn’t get any registration number on the screen nor i got any email with the details. how do i get the registration number? or lodge a new complaint on the same UAN number? I don’t know my EPF A/C number. Can you please tell me the same? i want my Withdrawal status of my PF Account TNMAS00035791000351473 which has been submitted dtd 20.02.2018 Pls find attached challane copy for the same. and still showing under process,can you explain me how many days it get to credit. We apologize for the delay in reply, as we’re getting so many queries at the same time. I am submit pf withdrawal claim form Deposit in dwarka on date 06/04/2018 but not received any amount on my account till date. Have you checked your claim status? sometimes it takes 15-20 days to get a full settlement. Once your claim has been settled, it will be reflected in your bank account after 1 or 2 days. Than I have tried to correct my Name mentioned in UAN as Mr Abhishek Sharma instead of Abhishek Sharma as mentioned in my Adhaar, but my Adhaar already verified by UIDAI & unable to modify the details. Pls give me the solution so that I would be able to transfer my old EPF a/c to New EPF A/c linked with UAN. PF Cliam under process last 2 April 2018. What ECR revision for the period 2017-18 is under process. 20 days no cliam received. mera uan no. 100452604167 or uan se login kar ke adhar update kyc kiya tha jo meri company tanon facility managment ne aprove kar diya ab pending by north field office delhi bata raha hai plz koi solution bataye. Maine fund request 02-05-2018 ko submit kiya hai but abhi tak meri request under process hai. Or mare friend ne bhi 02-05-2018 request submit kiya tha but uska fund uske account main a gya.or mera abhi b under process dikha raha hai. My name is Sangeetha mahalingam. I have working in Magna Infotech blangore for contractor employee .8 months worked cannot cooperative with transfer or withdrawal. EPFO login cannot approve d the bank accounts and not approved this company.please kindly help us and support this issue. Contract name: Magna Infotech Pvt Ltd,blr. Subject :bank account approved pending for EPFO transfer and withdrawal.and also on line claim process pending. Kindly help and support this matter. but till now now any amount dispatch in mySBIaccount . I have two UAN a/c in EPFO i. e 100279246621………. And.100279246632…….. I have checked my both a/c and found that one a/c shows balance Rs 4000 and another one display stalement or close. Please take attention and let me know the status of UAN NO….. as I have not withdrawn any money from my uan no. My name is Hardeep kaur. my UAN no 100933157527.my PF claim settled 20 nov 2018.but claim balance not credit in my account. This form not submit pls solve this problelm. My name is Jaykrishnan Nayanar and I worked with Aurobindo Pharma at unit 3 Bachepally between Dec1999 and Jan 2001.I donot know the PF number.Can you help me please. IN THIS AMOUNT,SO I REQUEST YOU TO PLEASE TRANSFER THIS AMOUNT MY ACCOUNT. Claim settled but Amount not received in bank. I have applied PF claim on 17 November 2018 given portal 18. nov. 2018 showing claim settled till the amount is not credited in my bank account hdfc where as every month my salary gets credited. I have already submitted ACR form my bank details to Regional PF head office Pin 110066 separately on dated 17.01.2019 speed POST no EM381314305IN IVR 6977381314305 sp NIBM 411048 and PF help desk addressing employer Mr Animesh Sharma on dated 26.02.2019. Speed POST no EM372332045IN IVR 6977372332045 SP Pune 411001. Track onwww.indiapost.govt.in refer photo pod for further details.